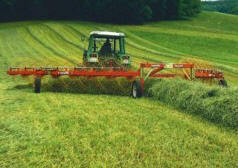 Tonutti has made a commitment to provide a full hay making solution. They not only produce Finger Wheel Rakes but also a range of Hay Tedders, Single Rotary Rakes and Disc Mowers. Tonutti has been manufacturing and constantly developing finger wheel rakes since 1965. Armed with the knowledge that finger wheel rakes are the best, fastest and least expensive answer for raking all kinds of forage, has lead to a dedication to constant product development, which has made them a market leader throughout the World. Manufacturing a variety of models you are sure to find one to suit your application. Most models are fully optioned so there is no need for expensive ‘add on’s’, and include splitter wheels and hydraulic open, close, wheel raise and lowering. Copyright © 2009 Clark Equipment. All rights reserved.